When my daughter and I first did the tour, it was AWESOME. But one of the highlights of the tour was being able to have VIP access to the Haunted Mansion Holiday attraction. They’ve since taken out all VIP access to attractions on nearly all of the tours (the exception being the train tour and is that really an attraction?). No news if they will allow it for this tour. How can you top Halloween at Disneyland? 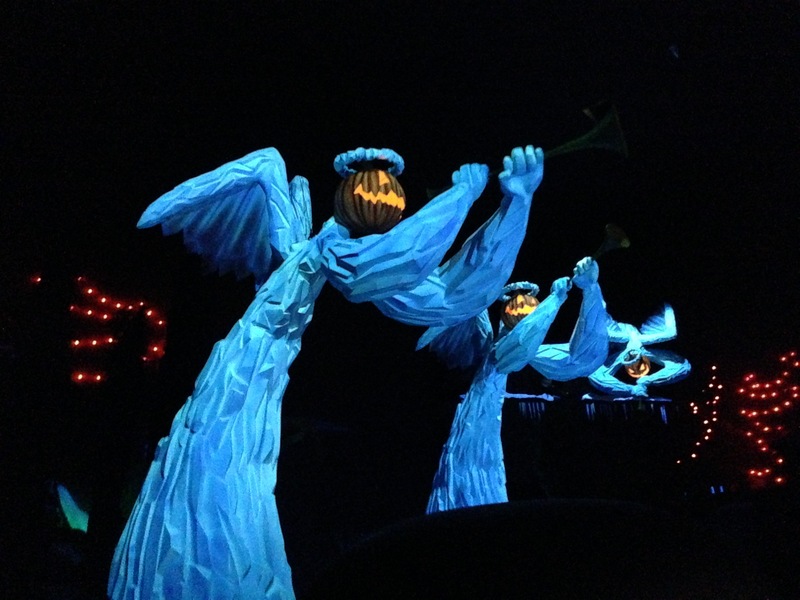 By adding the Happiest Haunts Tour to your day! Halloween at Disneyland is a big event. It’s probably second only to Christmas in the parks as a time of celebration. And to enjoy it to its fullest, take the Happiest Haunts Tour. Not only do you get VIP access to several rides and a collectible pin, but you have the opportunity to learn about Disney Halloween traditions, Halloween stories, and a little bit of trick-or-treating Disney style. Craig’s Favorite: Getting “backdoor” access to Haunted Mansion Holiday – and the really cool pin! This tour, unlike the Walk in Walt’s Disneyland Footsteps Tour or the Holiday Time at Disneyland Tour is less about Disney theme park history and more about fun and fascinating stories. So much so, we even had a second guide join our group after we rode Haunted Mansion Holiday (without waiting in that huge line). 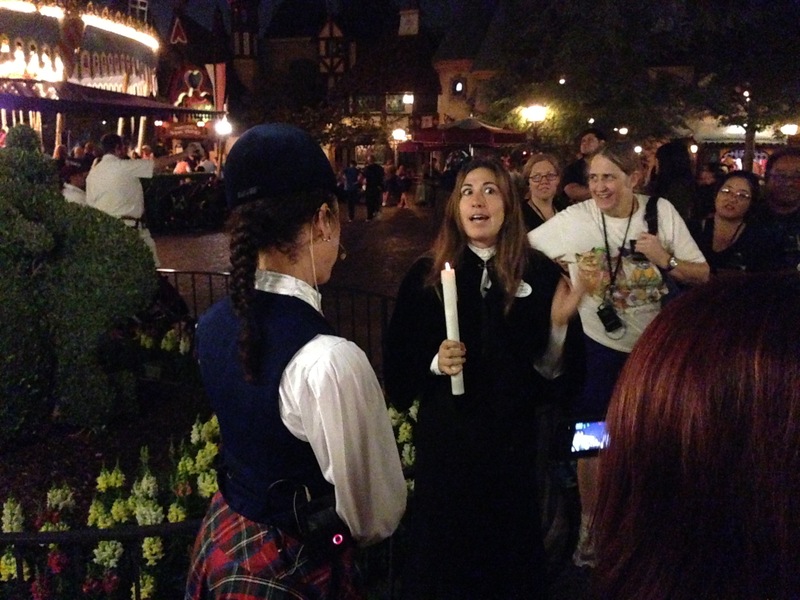 Gracey, our Ghost Hostess, added to our little journey together and gave us more info about the Halloween traditions. She was also very funny and entertaining. My daughter, Emma, thought she was the best part of the tour. And what Halloween tradition would be complete without trick-or-treating? We received a caramel marshmallow treat covered in orange sugar at Candy Palace that is only available on the Happiest Haunts Tour. We were also treated to iced pumpkin spice cookies decorated to look like, what else, pumpkins! And outside of Starbucks at the Market House we had our choice of a shot glass sized salted caramel iced chocolate drink or pumpkin spiced latte. Personally, not my thing, but most people loved it. If that weren’t enough, at the very end everyone received a special collectible pin featuring the Haunted Mansion. If you’re a pin collector, these are special treats since you can’t buy them anywhere. These tours are not only packed with interesting tidbits of information (like did you know there are 300 hand-carved pumpkins on Main Street with no two alike? ), but you feel treated like a VIP everywhere you go. We were given special access to four different rides – Haunted Mansion Holiday, Big Thunder Mountain, Snow White’s Scary Adventure, and Space Mountain Ghost Galaxy – and that is such a privilege. We seemingly had goodies wherever we went. And when we were given our cookies, other park guests gathered around hoping to get one only to be told, “Sorry, these are for Happiest Haunts Tour Guests only.” You feel very special on these tours and having two guides was extra fun. If you’re wondering if it’s appropriate for kids, my daughter was 10 at the time and loved it so much she wanted to go on more tours with me! There is a fair amount of walking involved and it is a 2 1/2 to 3 hour stretch with one short break, so keep that in mind, but this is a great tour overall to go experience as a family. The price for the tour did go up slightly (by $5 since my daughter and I went together), but worth the extra money for all the goodies and VIP access. Just remember that it’s a really good idea to reserve in advance as they do sell out, especially on weekends. You can reserve up to 30 days prior to your tour. And because this is a special holiday tour, it ends on October 31st so go and enjoy it today! Next Next post: Guardians of the Galaxy Breaking Ground and Breaking Out!